Are you facing panel repair replacement problems? Our most experienced service engineer have very good knowledge in panel repair replacement related issues. We provide service to very less service charge to our customers. Is your laptop got fell down in floor? is that laptop screen broken? don't worry about the laptop screen our hp laptop service center will replace your original hp laptop screen with low cost. we are the first bga station based chip level service center in hyderabad city. have a more than 10 years of experiences in this chip level service industry. Operating system installation is done for your hp laptop. windows 7, 8, 10 and linux operating systems available to install here. our talented executives to install dual and multiple os in single laptop. general service is required for every laptop at least three months once. because your laptop was occupied for daily usage. so every day dust will settle inner spare parts in laptop. password recovery is art of the laptop service industry. if you loss your laptop password, our service center will recover your password with operating system formatting. is laptop panel broken? 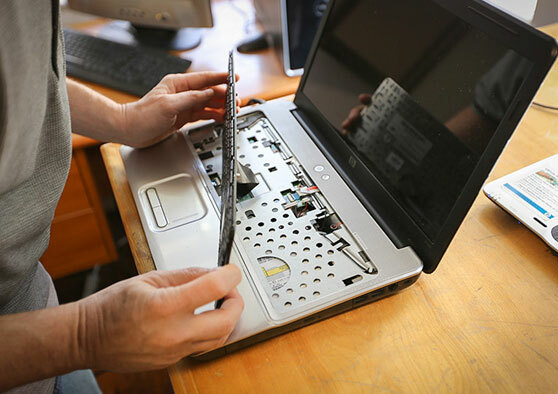 don't worry, our well trained engineer will replace your laptop panel with in a hour. we will did only replace original panels. laptop keyboard issue possible to rectifying problem only. hp service center provide keyboard service for your laptop. we will do change the laptop keyboard. Hinge problem is mostly view in one year old laptops. hinge got broken, hinges getting noise, hinges gap and other hinge problem will repair in our hp service center. We Adoration HP laptop repair service offers to our entire customers with the greatest service experience, while incessantly increasing our customer’s satisfaction and we all are keep developing ours knowledge in this industry . our hp service center is one of the best service center in ameerpet location. we provide service support for your laptop motherboard, display (or) Screen replacement, RAM Upgrade, HDD data recovery, password recovery, operating system installation and recovery, panel rework, laptop hinges rework and etc...!